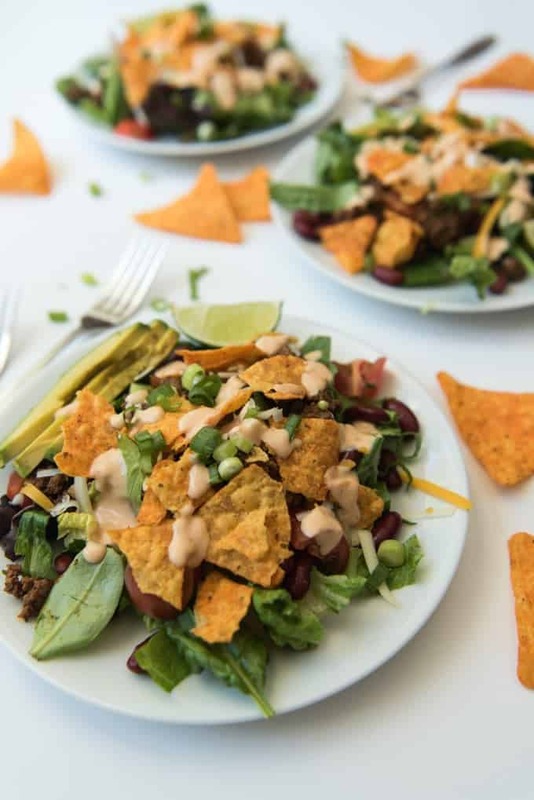 This crazy delicious Tex-Mex Doritos Taco Salad is loaded with taco meat, kidney beans, cheese, avocado, tomatoes and Nacho Cheese Doritos. That’s my kind of salad! Salads are my weakness. I don’t mean that in a pseudo-shameful way like I go hide in the closet to eat salad all that time – that would be what I do with chocolate chip cookies. I mean that salads are probably my biggest weakness in the kitchen. This crazy delicious Doritos Taco Salad is an exception. Truth be told, it is so loaded with beans and taco meat and avocados and Nacho Cheese Doritos that it hardly feels like a salad at all. That’s my kind of salad! My mom made this every summer while I was growing up. 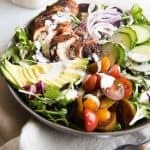 It’s one of those tried-and-true family recipes that comes back every year when the weather heats up and nothing sounds better than salad for dinner. 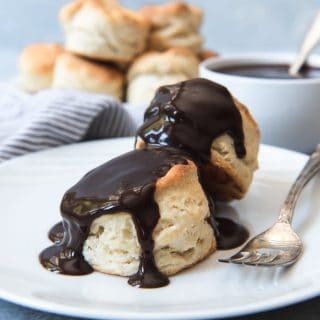 I had to actually pay attention to the measurements I included in this “recipe” since I have made this so many times that I typically just starting grabbing the ingredients and throwing it together without thinking. It seems like some people can just pull salad components out of thin air and create fresh, crisp, beautiful plates full of leafy greens and veggies and nuts and dressings. I have serious envy of those people because I really do love a good salad! But I definitely don’t have a knack for that – at least not yet, although it’s something I hope to change. One thing I know about the salads I tend to favor is that they have a good balance of textures. This Doritos taco salad delivers with a nice crispness from the cold lettuce and the crunchy Doritos. 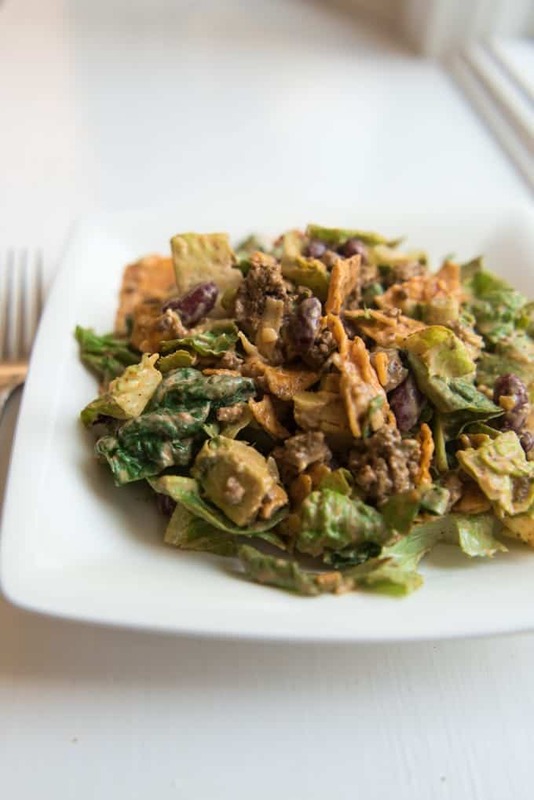 This is more like an American Tex-Mex salad than anything resembling what might be a true Mexican version of a taco salad, especially thanks to the American snack food addition of Doritos and Thousand Island dressing. But it still delivers as a crowd-pleaser, every time. One important thing to know is that if you mix the salad together ahead of time, the chips will get soggy and it will be no bueno. So wait until the very last second to dress and mix your taco salad and then serve. Or hold the Doritos in reserve and toss them on just before serving to preserve their crunch. I tend to make an extra large batch of salad ingredients and store them in separate containers so that I can quickly and easily throw this together for lunch the next day. 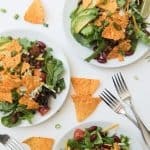 This Doritos taco salad is also a proven kid-pleaser. Clara (who admittedly loves all salad and asks for it for breakfast) will scarf down an already huge plateful of Doritos taco salad and then ask for a second helping. And even Rose, who usually turns up her nose at lettuce and just picks through looking for avocados, cheese and meat, will eat this salad in its entirety. When she’s in the mood. She’s 2. Don’t forget to like House of Nash Eat’s Facebook Page before you go! 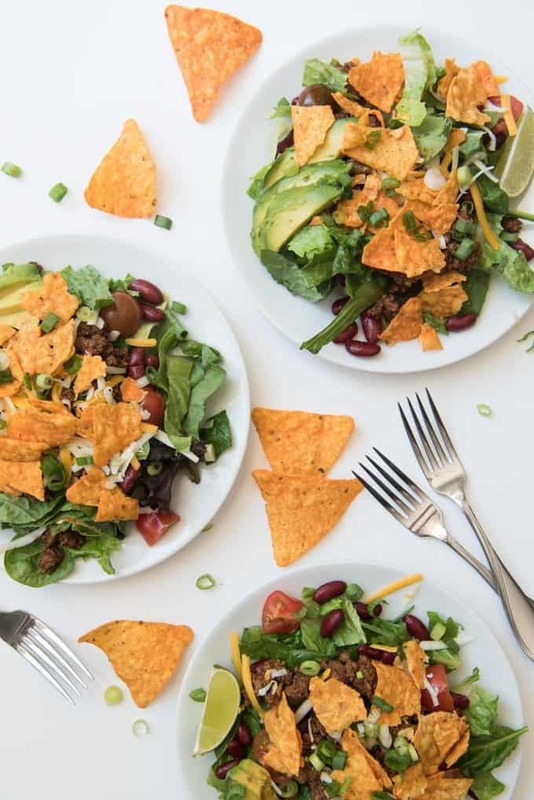 This crazy delicious Tex-Mex Doritos Taco Salad is loaded with taco meat, kidney beans, cheese, avocado, tomatoes and Nacho Cheese Doritos. That's my kind of salad! 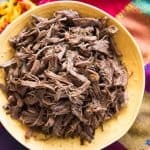 In a large pan, brown meat over medium heat until no longer pink, then prepare the taco meat according to the package directions or this recipe. In a very large bowl, combine all salad ingredients except dressing and Doritos. Toss to combine. 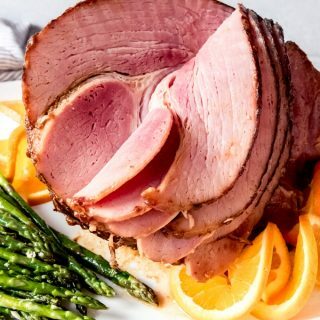 Plate large, individual servings (if serving this as a meal instead of as a side salad) and sprinkle partially crushed Doritos over each portion. Serve with Thousand Island dressing. 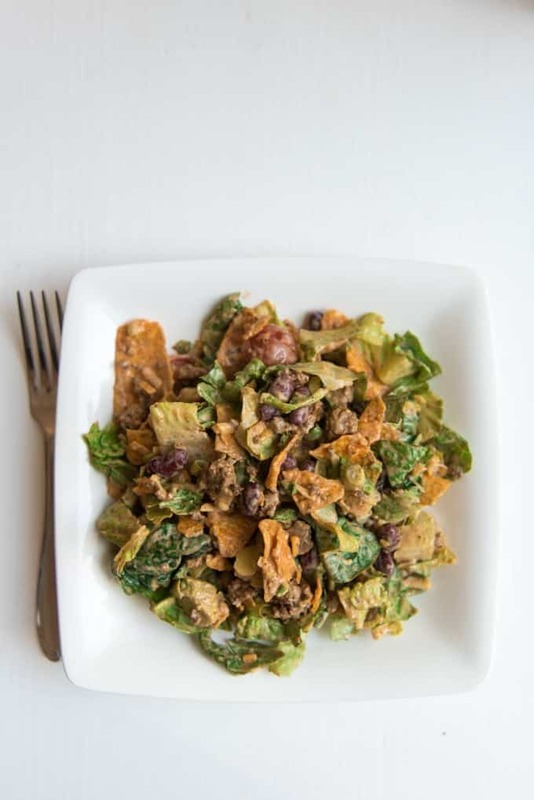 OR (and this is the way we most often serve this) add the partially crushed Doritos and Thousand Island Dressing to the other salad ingredients in the large bowl and toss again to evenly distribute the dressing. 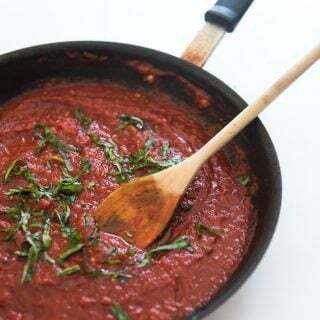 I like to only do half the dressing to start out with and then add more as needed to get the amount of salad to dressing ratio that I like (I prefer to err on the side of less dressing and then more can be added to individual portions as desired. You could add a small can of sliced black olives to this as well. Except I'm not a fan, so I don't. Also, I have seen French, Catalina or Ranch dressing used in place of Thousand Island, but since I grew up with Thousand Island as the only option for this salad, it just doesn't taste the same with a substitution. 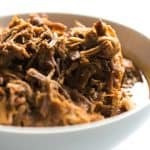 And I have a recipe for Whole 30 compliant easy weeknight taco meat here that you can use instead of a seasoning packet! It's even more delicious and takes only a minute longer to pull the spices out of your cupboard. Love when I can print recipes straight from my phone, which I just did. Your website is so slick, Amy! So happy/proud of this awesome website you created! Doritos are totally my weakness! Love it!